HomeSharePoint 2010 Hosting :: How to Custom Calendar with JQuery? Here I will explain how to use the SharePoint 2013 calendar color overlay, to give a different color for each category. Calendar color overlay in SharePoint is by stacking several views that have been created with the filter each category, but it also set up an empty view for displaying data named Calendar Canvas as the foundation to be coated view-view is already filtered by category. Items in the calendar will be color coded based on their assigned category. This example is using ten category choices in the Category column of a Calendar list: category 1, category 2, category3, category4, category5, category 6, category7, category7, category8, category9, category10. Ten public list views will be created, with each view set to filter and display one of the ten category choices. Finally the views will have all associating overlay calendar views (New Calendars) created to enabled color coding. Create a new Content Type called RollUpCalendarContentType. With associated artifacts. Complete the solution add a master with JQuery and a Page layout. Add new folder called Modules and add two Modules to this folder called CSS and Scripts. 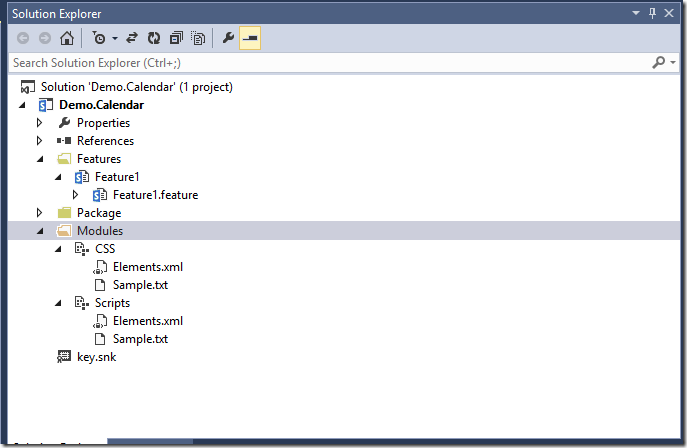 Create a Folder called Code and add these classes to the folder changing names spaces to reflect this project. I know some would say create a DLL and reference that in your project but I have had occasion to use a 3rd party solution where the DLL was not available so I choose to keep my dependencies self contained as much as possible. We need to create a Content Type that inherits from Event so lets create an Event Receiver and Create one. 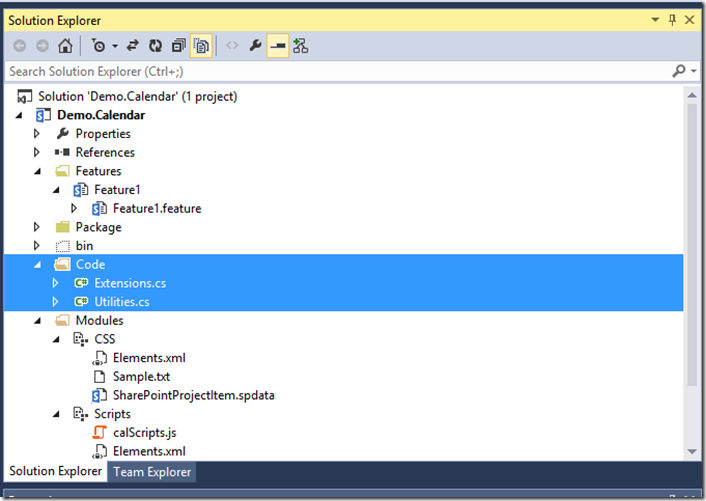 When we added our Modules Visual Studio in its Goodness automatically added a Feature called feature1 let’s rename it to AddCalendarArtifacts this will be a feature that is site scoped so we can add the Scripts, CSS, Site Columns and Content Type within this feature. The Scripts and CSS Modules are already added to this feature so we need to add an Event Receiver here to add our content type. In addition we will need to create the Calendar List which can be Instantiated within any web in our site collection called RollupCalendar. Thus we need a feature scoped to Web with an Event Receiver to create the List.